Proactive Eye Care Safeguards Lasting Vision. Book Your Eye Exam Today. Caring for your eyes is the most important thing that we do. As eye care professionals, we know how complex and fragile our eyes are. Working closely with our patients, we watch for changes in visual acuity and eye health. We are currently the only eye care practice in Wichita utilizing the iWellness to its maximum potential. This innovative, fast, and pain-free technology gives us unprecedented visibility into your eye health. The American Optometric Association recommends annual or bi-annual eye exams, even if you feel your vision is ideal. This frequency ensures that vision-threatening eye diseases, such as glaucoma, are detected before they have had the opportunity to impair vision. Most eye diseases develop with no signs of trouble. Glaucoma, for example, slowly carves away at your peripheral vision- most people don’t notice until they already have some degree of tunnel vision. Schedule your fast, non-invasive eye exam at The Eye Gallery today. Book your appointment. Dr. Baldwin may perform additional tests as needed. Our eye exams serve two functions: they determine how well you can see (and whether or not you need glasses); they look for signs of developing diseases and other conditions that may influence your vision. Most of the time, when someone needs to wear corrective lenses it’s because of a common refractive error. There are four types of refractive errors: myopia (nearsightedness), hyperopia (farsightedness), astigmatism, and presbyopia (also called “aging eye condition”). 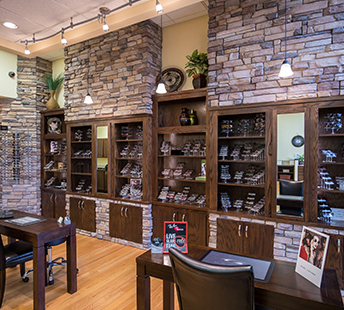 During the eye exam we will determine if your vision requires correction. Most refractive errors can be managed successfully with corrective lenses (eyeglasses and contact lenses). Unfortunately, our eyes aren’t always the best at telling us when something is wrong. With many eye diseases being asymptomatic – meaning they don’t have obvious or painful symptoms – detecting them before they influence your vision is key. Our practice uses some of the most advanced technology available in eye care today. Using it, we can detect even the most subtle of changes to your vision. Working together, we can reduce the influence of eye diseases by as much as 95%.